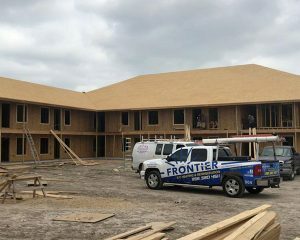 Frontier specializes in air conditioning installations, Manual J Installations, HER’s Rater tests, and Blower Door Tests for all newly-constructed homes, condominiums, and apartment buildings. It all starts with air duct design and planning. Every duct will be sized to accommodate the volume of each room. We use only R-8 duct to provide the customer with an energy efficient A/C system. All air ducts will be balanced properly at the end of construction to make sure that each room is just as cool as the one beside it. The installation of an Air Handler, whether it is in an attic or closet, will be completely sealed at the seams and leveled to make sure all water is properly drained away so that it doesn’t stay inside the air handler. The condenser will also be properly leveled and charged with Superheat and Subcooling to ensure that it works as specified by the manufacturer. An improperly charged system will actually cost you more money to run than a properly charged one. Proper installation of an air conditioning system and ductwork is important and will determine the health and lifespan of your system. Our installers and technicians are trained with the newest technology, tools and installation practices to ensure that your air conditioning unit is ready to run. Give us a call today to discuss your upcoming construction project and we’ll make sure your HVAC needs are fully taken care of.